Photo of Pat Dye Field taken Friday, the second day of a week-long renovation. The turf at Pay Dye Field is in the process of being replaced in order to remove nearly a decade’s worth of drainage-impeding (not that you could tell) organic matter that has accumulated since it was laid in 2003. The result? Auburn will play it’s 2011 home games slightly farther from God. Kleypas said the process will take about a week. 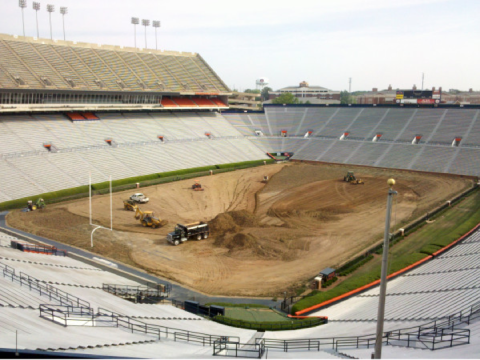 According to Klepyas, Auburn’s marketing powers that be tossed around the idea of selling the field’s old sod as souvenirs, but decided against it. “You cut the grass into those squares but it really has to be freeze dried so it doesn’t rot,” he said. Instead, it will be tilled and used as top soil for landscaping at Auburn’s new OIT building on Lem Morrison Drive. Kleypas said the field’s new sod is a thicker cut that is game-ready almost as soon as it’s laid. Hopefully its NOT the same sod they used for the BCSCG. Who do I ask to have the waste soil laden with organic matter and excellence dumped on my lawn? My grass needs some help. I would have bought some. but not to hang on my wall. I would have put it in my yard. Woulda been sweet. It’s a shame that in a school with a great ag program we don’t have anyone in facilites/athletics with the sense to burn the bermuda at the end of each season to remove the waste without spending a small fortune resodding. It’s a natural, cheap process and the grass would be back better than ever well before football season. But what do I know…I’m just an AU hort grad! There are alot better things we could spend that sod money on, like maybe a new JUCO QB. I keed, I keed! Well, what kind of sod is it? Can’t you boys say “TiffSport” developed by the University of Georgia? I remember when they replaced it that time. Its crazy how much sod it takes to fix a field.